Club Penguin Cheats by Mimo777 Club Penguin Cheats by Mimo777: Club Penguin Furniture Sneak Peek! Club Penguin also wants you to know they added a new version of Fluffy the Fish to the Beta Team site. Yeah, we kinda already knew that, huh? But, they would like to know if you like playing the game using a mouse or keyboard? Hey Mimo, If you login using this URL you can be idle for more than 10 mins and not get kicked from the server. hey mimo. remember the vidio that said like "tip the iceburg" and "tune in the clubpenguin on august 11". well its the 11 and nothings changed...yet. so ceep checking. 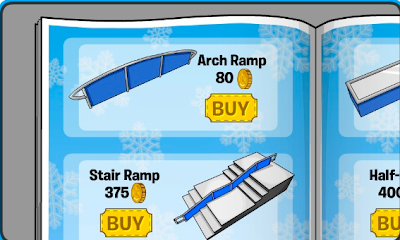 Nice, looks like you can turn your igloo into a funky skate park! whats up with winter parties in august??? I hope we will be able to really get up off the ground with these. Like you can't really climb the climbing wall. Too much flat floor space in the igloos. I want to go UP! well you remember chobots.com? yeah well its been shut down!! :O :O becouse there has been people hacking into the site and stuff and ruining it! and well it has turned out pretty bad. so mimo what would you do if club penguin was shut down!!?? i just wanna no what would people do if it was shutdown couse i never want cp to shut down couse i love it!!! Hey. Did you ever notice the puffle whistle in your inventory? It's in the hand items section. If you're a secret agent and you have Elite Penguin Force: Herberts revenge, you can use it to call Flare without having to use your spy phone.